After the surprise hit of their debut, NESferatu, the duo of darkNES and :EYG: are back with even more EBM inspired carnage and their latest offering, Sega Lugosi's Dead. Inspired by everything from Dig-Dug to, well, balls (or rather "BALLLLLLLS!!! "), The Gothsicles leave no stupid stone unturned. Sega Lugosi's Dead combines their signature infectious bouncy hooks, offbeat sense of humor and love of all things geek, producing an album that surpasses their first. 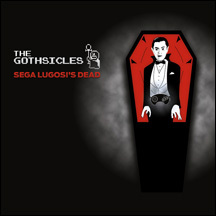 Sega Lugosi's Dead features guest appearances from Prometheus Burning, Cyanotic, The Dark Clan and unwittingly, Caustic. In addition to the album tracks, Sega Lugosi's Dead contains remixes from Alter der Ruine, System Syn, Iszoloscope, Boole, and DEFCON!